The first 'double header' race weekend of the season at Castle Combe on June 15 and 16 is dubbed the 'Wessex Chambers Summer Races'. Members of the chamber are eligible for up to 25 free tickets which they can use as staff incentives or rewards and to invite clients who might never have experienced live motor sport before. The innovation also gives a boost to drivers and their sponsors, who will be exposed to a new audience. For the circuit's three 'home' championships, this will be a demanding weekend, with the need to perform on both days, as each race is treated as a stand alone event, with its own qualifying session. After his history making win at the last meeting, when Chippenham's Adam Higgins won the Startline Formula Ford 1600 race, 30 years to the day his father Bob did the same, the Higgins family will be on a high. Adam is now just two points behind championship leader Steven Jensen from Saltford and brother Richard, from Burnham on Sea, is 3rd in class B, after his win and 'Driver of the Day' award last time. Bob, a former quadruple champion, is also moving back into contention, having finished 7th overall and 4th in class B, despite being 64 years old. Bob's weekend will be even busier than usual as he is also taking part in the three Ma5da Racing Series encounters. Coventry's Nathan Ward, who was deposed from his class lead by Richard Higgins on the last corner at the last race, is still the B class leader, with Yatton Keynell's Luke Cooper snapping at his heels in his Swift SC92, which was way down on power last time out. Kevin Mills Racing Team driver, Roger Orgee, from Langford, will be keen for a smooth run to get on terms with his team mate Jensen, whilst a couple of youngsters who could be in on the action are Ashley Crossey from Flax Bourton in the Spectrum 011C and Timsbury's Oliver White in the Van Diemen. Also back in class A is Melksham's Ed Moore, keen to find his old form again. Corsham's Will Di Claudio still leads the Castle Combe Saloon Car championship, in association with National Windscreens, but his task gets tougher every meeting, with success ballast added for each win in his class C Peugeot 106. This time he will be on the maximum allocation of 60 kilos, a heavy burden for the little car. This should allow Seend's Adrian Slade to edge closer, though he too has a 20kg addition to his 106. Despite his extra weight, Di Claudio has still been capable of running at the front of the field, especially early in the race, though no-one should be in any doubt the Astra of Bristol's Mark Wyatt is now the class of the field. His relatively lowly championship points position belies the Astra's speed, only an errant back marker preventing a straight run of wins this year. Consequently, Wyatt is still relatively un-weighted so yet more lap record breaking runs are possible. Calne's Tony Hutchings is not so far adrift when his Audi TT works as he would like it, whilst Burton's Rob Ballard tops the Class A points in his SEAT Leon Cupra. The similar Vauxhall VXRs of Seend's Julian Ellison and Keynsham's John Barnard are not far behind. Bridgwater's Tony Dolley is Wyatt's theoretical class B points rival in his Peugeot 206. Charles Hyde-Andrews-Bird from Ditcheat is still clawing back the points in class D after his 1st round non-finish in the Fiesta, whilst Chippenham drivers Steve Sutton and James Winter have been good points scorers in their 106s in classes D and C respectively. It's still early days for a clear pattern to evolve in the siliconehosescom Sports and GT championship, even though it's fairly clear Simon Tilling has a car which is super quick when it behaves itself. Tribulations have kept the 2011 champion from establishing any kind of outright points challenge, benefitting the likes of Josh Smith from Weston Super Mare and Trowbridge's Andrew Shanley in their Radicals. Delighting spectators with his new 'Grand Am' Riley TD at the last meeting was Salisbury's Nigel Mustill, the rare in the UK 6.2 litre machine making another appearance this time. Similarly engined, but a totally different kind of car, is the TVR Tuscan of Perry Waddams, which is wiping up in class D for more production based cars. Sunday's entertainment includes two rounds of the Vortex Dunlop Fiesta championship, won last year by Yatton Keynell's Jason Cooper, also the 2009 Castle Combe Saloon Car champion. Cooper is now employed as a driver coach and test driver and will be helping some of the drivers to achieve their best at his home circuit, virtually in his back garden. With Caterham now established in Formula 1 and with ambitions at Le Mans too, its grass roots are still as strong as ever, with various derivations of the 'Seven' providing a ladder of racing progression for vast numbers. The BARC McMillan Motorsport Caterham Graduates championship races include classes for four different types of Caterham, with engine power ranging from 100 to 140 bhp. All the cars are derivations of 'road-going' Sevens and some are driven on the public roads. Very few changes from the standard specification are allowed, placing the emphasis firmly on driving ability rather than car development and set-up. A unique 45 minute 'handicap' race backed by Honda, in memory of the late Dave Allan, the manufacturer's former test driver from Swindon, will see a diverse range of saloon and sports cars taking part. A mandatory pit stop adds to the interest and some prestigious entries are expected, including some from the 'Britcar' championship. Saturday's action starts with qualifying at 08:40. Racing gets under way from 13.45 and will go on until around 18:00. Sunday gets under way with qualifying at 08-30, with the first race at 11.45. Admission prices are on Saturday, £10 for Adults, £7.50 for OAPs, Paddock Transfer free and on Sunday, £15 for Adults, £10.00 for OAPs, £2-50 for Paddock Transfer, whilst accompanied children under 16 are admitted free on both days. 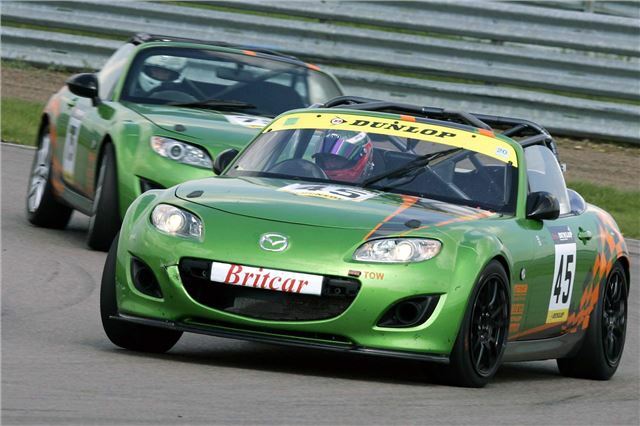 For further information, visit the Castle Combe Circuit online at www.castlecombecircuit.co.uk, or on Facebook or Twitter.